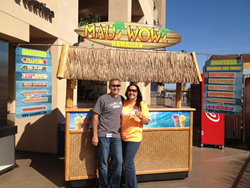 Ron and Barb Putman stand in front of their Maui Wowi cart at Petco Park. We are looking forward to a great relationship with Petco Park and being able to bring Maui Wowi’s quality products to a venue that meshes well with our laidback vibe and Aloha Spirit. Maui Wowi Hawaiian Coffees & Smoothies, a leading beverage retailer at events and venues, is bringing its fun, island flavor and quality products to Petco Park for the 2015 San Diego Padres Major League Baseball season. With two island oasis locations inside the ballpark, fans will enjoy high quality, fresh fruit smoothies, as well as adult beverage “Smoothies that Party” that include Pina Coladas, Strawberry Daiquiris, and more. Southern California Franchisees Ron and Barb Putman will be running operations at the two units with one located at the Mercado Food Court and the other at Park at the Park. Their tiki hut style mobile units, known as Ka’anapali Carts, are show stoppers that instantly transport you to paradise, without the expensive airfare. Perfect for sunny California days, Maui Wowi serves refreshing smoothies that will make any game a winner. “We are looking forward to a great relationship with Petco Park and being able to bring Maui Wowi’s quality products to a venue that meshes well with our laidback vibe and Aloha Spirit,” said Mike Weinberger, Chief Executive Officer of Maui Wowi Hawaiian. Ron and Barb Putman have been franchisees with the company for over nine years and are also Directors of Regional Support to other franchisees located throughout Southern California. They have numerous mobile Maui Wowi carts placed at venues and sports complexes throughout the area.